ATC import s.r.o. 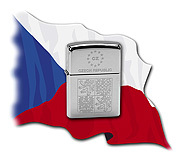 is a specialised importer and supplier of lighters, smoking supplies and promotional items in the Czech Republic. The company has been trading not only in the Czech Republic and Slovakia, but also in neighbouring European countries since 1991. ATC import s.r.o. is the exclusive representative and distributor of products for the Czech Republic and Slovakia. Apart from the range of Zippo products, ATC import s.r.o. also offers products from other renowned brands such as . We offer our customers a complete range of products suitable for smoking supply shops, tobacconists, newsagent stands and gift shops. Our sample rooms in Prague and Přerov are a business point for the owners of shops, tobacconists, newsagent stands, etc., where it is possible to view our entire range in a pleasant environment with the assistance of our knowledgeable sales staff.